CORPORATE FURNISHED HOME, VERY CLEAN, Renovated, Close to All 'Hot Spots' in Augusta...GREAT LOCATION!!!! This spacious home on a 1/4 acre with 4 bdrms (2 MASTERS!) and 3 full bath is FULLY FURNISHED, LG NEW HDTV with WIFI, UTILITIES INCLUDED, MAINTAINED LANDSCAPED, fenced private backyard with attached deck off the kitchen and dining area. This HOME is PERFECT for the SINGLE Corporate Professional or a Group having an extended stay in Augusta, Ga and wants to have a Home avoiding hotels. The Home is ideally located across the street from the renown Augusta National Golf Course that has a public spacious couple mile sidewalk which is fiercely lighted with southern street lamps during the evening or earlier morning hours. 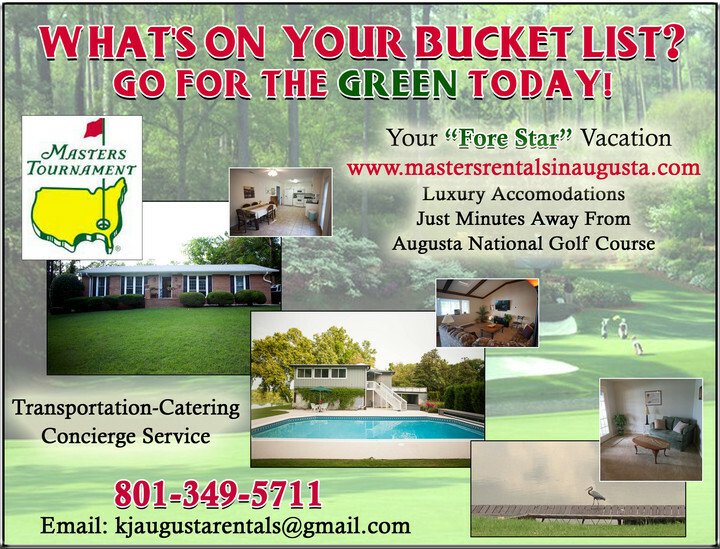 If your interested in renting this home during the year or Masters Week you'll be happy to know its close proximity to the course. It is a 5 minute walk to Gate 10 patrons entry for Masters Week. The house is within walking distance to public transportation, Super Kroger and Bi-Lo major shopping center as well as a large park with bike trails and hiking paths. It is also surrounded by many good restaurants, a movie theater, gas stations, cvs drug store and the Augusta Mall. The University and GRU along with Fort Gordon are also very close by. The Home is situated in a quietly secluded cul-de-sac, residents will enjoy the peaceful atmosphere and comfortable furnishings. Recently renovated, the house includes a brand new master bedroom with full bath and walk-in closet. The interior and exterior of the house are freshly painted, with new crown molding and refinished hardwood floors. Energy saving features include a new roof with architectural shingles, insulation under the house with a mold resistant barrier, and updated triple pane glass windows. There is easy access to Interstate 20 and many other sites of interest. There is a Very Large Park walking distance from Home. Landlord pays for Yard Service and Maid Service for every Rental!! !